Indium Corporation's Indium5.1AT Pb-Free Solder Paste was awarded the Innovation Award at Nepcon China in Shanghai, China. Sponsored by EM Asia Magazine, the Innovation Award recognizes excellence in the Asian electronics industry. This is the third award for Indium Corporation's Indium5.1AT Solder Paste. 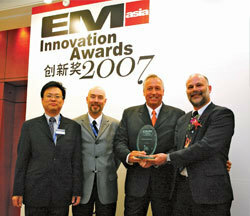 It was awarded the Global Technology Award in 2006 and the 2007 SMT China Vision Award earlier this year. It is the second consecutive year that Indium Corporation has been recognized with an award by EM Asia Magazine. Indium Corporation won an Innovation Award for its NF260 No-Flow Underfill in 2006. Indium5.1AT is an air-reflow, no-clean solder paste that provides increased finished goods reliability when compared to competitive solder pastes. It features ultra low voiding (in the 5% range) when soldering BGAs with micro via-in-pad designs. No other solder paste is known to exceed this level of performance. In addition, Indium5.1AT was specifically formulated to minimize the impact of downtime on printed deposit volumes, ensuring a consistently high reliability on board assembly. This gives customers increased reliability while at the same time saving them money. To learn more about Indium5.1AT click here. For more information about Indium Corporation visit www.indium.com or email Anita Brown abrown@indium.com.